When I try to download the Allegorithmic demo the launcher just says 'syncing' but doesn't actually end up downloading it? I've tried restarting windows and it didnt help? We're aware of the issue and are implementing a fix. I'll update you when the fix is deployed. The fix is now implemented! Enjoy Substance Atlantis! 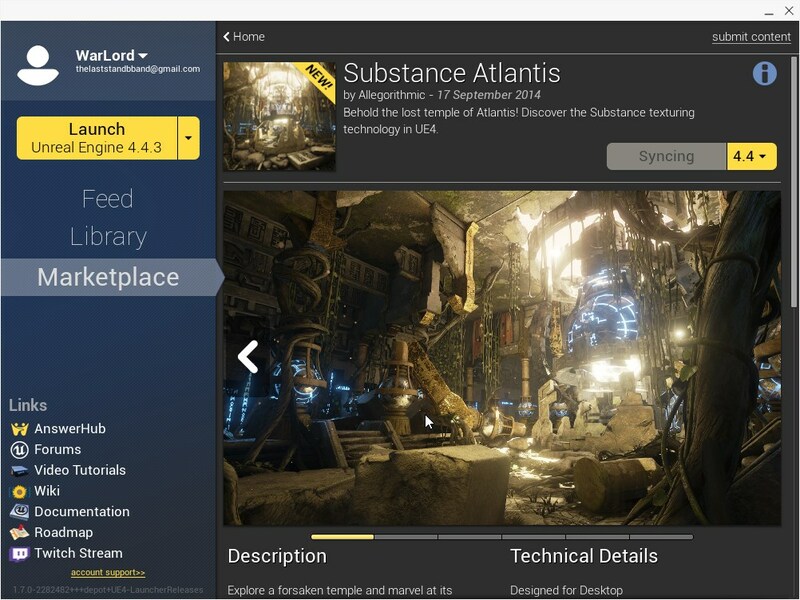 We fixed the issue with Substance Atlantis, so it's likely you have a separate issue. If restarting the launcher doesn't fix it, you may need to reinstall the launcher. I deleted the Launcher and its preferences, installed it again and still "syncing". Any other suggestion? PS: "Substance Atlantis" downloaded fine. I'm investigating the problem further. Thanks for the report, I'm seeing the issue now, too. How long did you wait for it to finish Syncing? I first had the problem last Saturday and I've been trying since then. The launcher had been opened for hours. The other demos start downloading immediately. I'm working on escalating this. Can you also make a new Question thread and post the link here? It'll make it easier to track the problem (rather than confusing it with the Substance Atlantis issue).